Helllllllllo Holiday Season! This year, I have already participated in 4 Thanksgiving gatherings over a span of 3 days. I will have one more later this week. I can’t wait. These gatherings provide me many opportunities to try new exciting recipes or simply work on perfecting dishes I’ve created before. 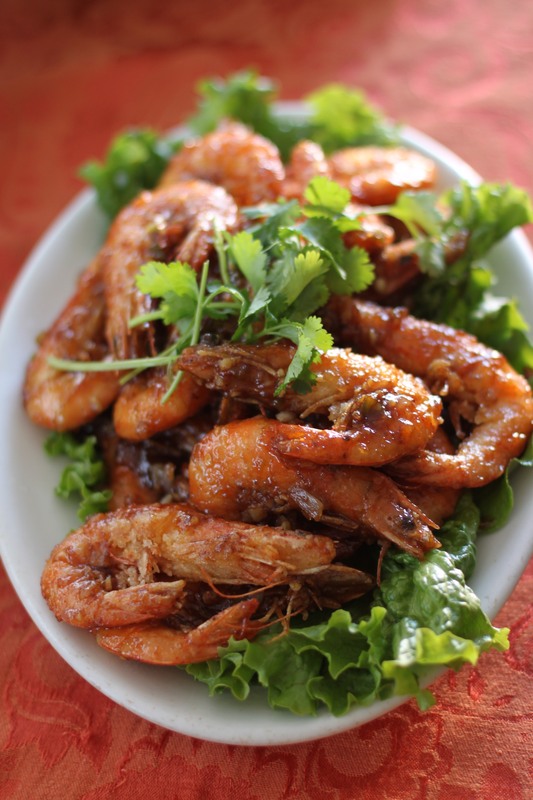 With this Tamarind Shrimp recipe, please be prepared for a huge explosion of flavor in the mouth! Jane and I originally planned a non-traditional Thanksgiving menu for lunch with her family and her aunt’s family. We were just going to do Vietnamese Hot Pot, but the day before the lunch, Jane’s aunt called me and requested that I make Tamarind Shrimp. She remembered me making some many years ago at a Thanksgiving dinner and was craving it. I said “Sure!” I was very excited to make Tamarind Shrimp again, but to be honest, I couldn’t really remember how to make it. Luckily with all the Thai/Viet ingredients I’ve learned to cook with over the past few years, I quickly wrote down all the ingredients I think is needed and went with it. In the end, we ate about 2 1/2 pounds of shrimp for appetizer and now I want to make the sauce again and put it on everything. The ingredients and measurements I used for the tamarind sauce below is what seems to work for me. Please play around with the ingredients to get the right balance for you. For example, if you like more pungent salty flavor, add more fish sauce. If you like it sweeter, add more sugar. If you don’t like flavor…try another recipe! This sauce should work great on fried chicken wings as well. For all you Thai food lovers, this is the sauce I will use in the future for an updated Pad Thai recipe. Tamarind Sauce – In a small saucepan, combine tamarind liquid, palm sugar, fish sauce, water, and Sriracha and bring to a slow simmer until the sugar is dissolved. Note: Use brown sugar if you do not have palm sugar. Regular granulated sugar works fine as well. 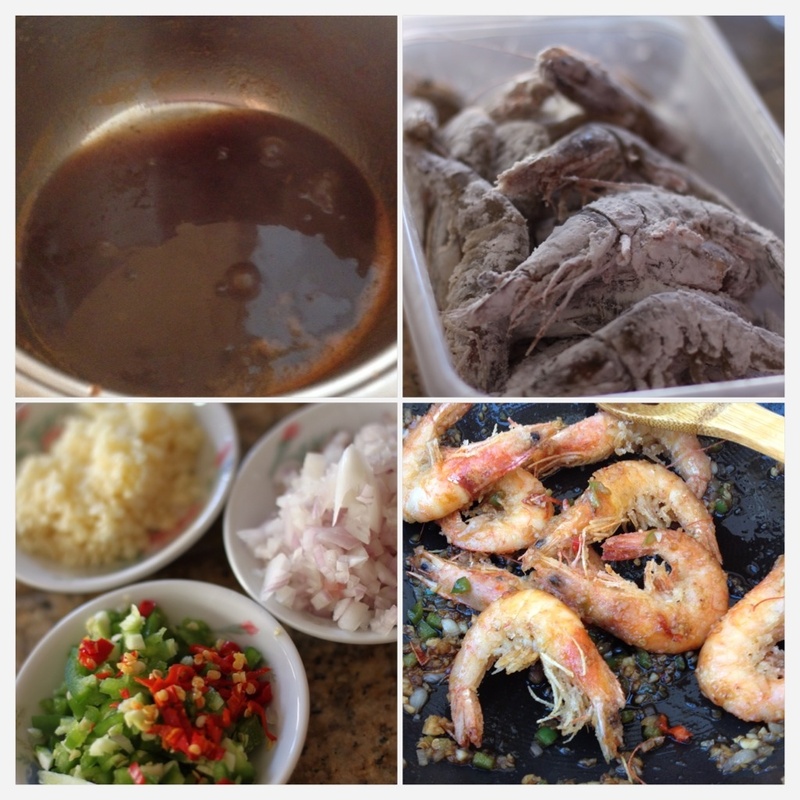 Shrimp Preparation – Season shrimp with Salt and Pepper and mix. Note: I think this dish will not taste the same without the head and shell, but if you don’t like it, remove it! Frying Shrimp – Turn deep fryer on to 350 degrees. In a medium sized bowl, add Tapioca Starch (If you don’t have Tapioca Starch, you can use Potato or Corn Starch as well). Dredge shrimp in Tapioca Starch, shake off excess starch, and once the deep fryer is ready, drop the shrimp in ~6-7 at a time and cook for about 90 seconds or it looks done. Repeat until shrimp frying is complete. 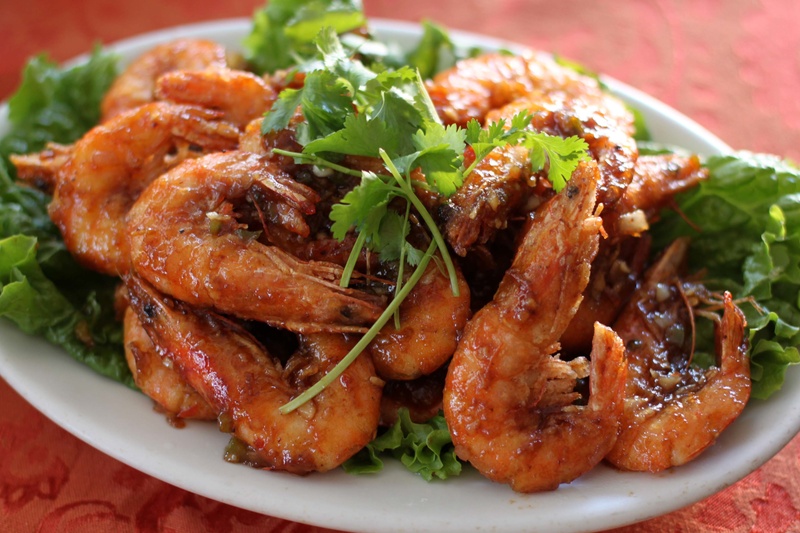 Tamarind Shrimp – Heat Wok on Medium High. Add 1 tablespoon of oil. When oil looks hot, add garlic, shallots, jalapeno, and Thai chili peppers and saute for a minute. Add 5-6 tablespoons of tamarind sauce and continue to stir for another minute. Add shrimp and coat with tamarind sauce. Plate and serve immediately.